Trimming and pruning hedges and shrubs helps keep them healthy and looking great. It is needed to remove any damage, dead branches, and check for any signs of illness or disease. While shrubs and hedges can add visual appeal and interest to your property, it is important to learn how to prune and trim them properly so they can continue to thrive. Anvil Pruners – A hand tool consisting of a sharp blade that meets a flat plate. They work best to cut dead wood. Bypass Pruners – A hand tool consisting of a sharp, curved blade and a dull curved hook. They function like scissors, with the blade passing over the hook. They make clean, precise cuts and don’t crush living tissue like anvil pruners can. Lopper – A long handled version of either bypass or anvil pruners to provide leverage. They are used to cut more substantial material. Standard Pruning Saw – A sharp saw for making precise cuts in a restricted area. The more teeth the blade has, the more precise the cut will be. Some models can be folded for safety and convenience. Hedge Shears – A double-handled pair of shears used for trimming and shaping shrubs and hedges. For shrubs that flower in early spring, trim them after they have finished blooming, generally towards the beginning of summer. Shrubs that flower in the summer should be trimmed in the winter or early spring. Non-flowering shrubs should be trimmed after the new growth for the season has come in completely, and all of the new buds have developed into leaves. 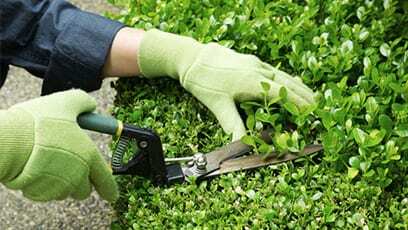 Minor trimming and pruning throughout the summer is acceptable to ensure the health and aesthetics of your shrubs and hedges. Remove dead branches at the base of hedges. For informal hedges that do not get shaped, remove old stems, and cut larger branches to ensure they don’t grow too tall or spread too wide. With formal hedges, don’t prune into old wood, as the hedge will not grow back from where you’ve trimmed it. The only exception to this is yews. Make sure the bottom of the hedge is slightly wider than the top so that the entire shrub can receive an equal amount of sunlight. If the plant is all the same size, or the top is slightly larger, the bottom may become shaded and turn brown from lack of sunlight. Follow the rule of thirds and trim only 1/3 of the shrub each year. Every cut you make will stimulate new growth, and help the plant become stronger and fuller. If you’re looking to shape your shrubs and hedges into straight lines, use your home or driveway as a guide. Set up some string on stakes to get the shape and cut accordingly. Make sure you are not trimming too deep into the hedge. Call the professionals at DreamWorks Tree Services today at 1-800-407-9917 or contact us online for more information on our hedge trimming and shrub care services. Proper care and maintenance is important to ensure they stay healthy and maintain their appeal for years to come. Trimming and pruning hedges and shrubs helps keep them healthy and looking great. It is needed to remove any damage, dead branches, and check for any signs of illness or disease.